Finger Lakes Times Publisher Paul Barrett was the keynote speaker at an economic development forum Tuesday in Owasco, near Auburn. 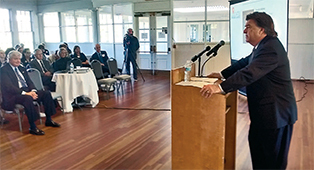 OWASCO — Sometimes it takes an outsider to appreciate all the assets of the Finger Lakes, said two speakers at an economic development forum on the shores of Owasco Lake near Auburn Tuesday. Finger Lakes Times Publisher Paul Barrett, the keynote speaker at the Locate Finger Lakes Economic Development Summit at Emerson Park Pavilion, said he has hosted newspaper executives from around the country as part of his job at the paper. Most of those visitors, he said, had never heard of the Finger Lakes. “They think this is New York City,” said Barrett, who has led newspapers all over the South and Midwest. “They walk away from here absolutely astounded” by the beauty, the people and the cultural and recreational offerings. An economic developer in Schuyler County, who came to the job after working in economic development in Delaware, agreed. “There’s all these incredible assets that we have in upstate New York that we don’t put together,” said Judy McKinney Cherry, executive director of the Schuyler County Partnership for economic development. McKinney Cherry and Barrett were two of several speakers touching on a host of economic-development issues at the forum. This region, he said, might take a few tips from how economic development is done in parts of the South. He pointed to his time in Mississippi, where he served as chairman of the East Mississippi Business Development Corp. There, he said, government worked hand-in-hand with the private sector to grow the region’s economy. At one time, said Barrett, the region enjoyed an unemployment rate of 2.5 percent. Locate Finger Lakes Director Mike Nozzolio, a longtime state senator, said it’s that cooperative spirit of the larger region that will drive job growth in the Finger Lakes as well. Nozzolio said it’s rare to see so many economic developers, business representatives, government and university officials in the same room, as was seen at Emerson Park Pavilion. His goal, and that of Locate Finger Lakes, is to bring those resources together to achieve a common goal of sustainable job creation. “Together, as one region, it’s so powerful,” he said. Nozzolio said the Finger Lakes must further integrate the area’s colleges and universities into the economic-development mix, and he pointed to the work going on at Cornell AgriTech in Geneva, where the new state Center of Excellence in Food and Agriculture is underway, thanks to $1 million in state funding. The new Cornell center looks to encourage academic and business connections and collaborations to grow New York’s agriculture and food economy. Jan Nyrop, director of Cornell AgriTech, home of the Center of Excellence, said its potential is enormous. “I have a vision that New York is going to be the food capital of eastern North America,” Nyrop said, noting that the state is second in the food-manufacturing sector and in food-venture funding. He believes there is potential for the state to add $3 billion to New York’s gross domestic product by developing food-related businesses. “I cannot achieve that vision on my own,” said Nyrop, pointing to those connections that Barrett touched on. In this case, said Nyrop, the connections are between research efforts at the region’s universities and colleges, the farmers, as well as the entrepreneurs, retailers and distributors. McKinney Cherry noted what an advantage it is to have Wegmans call the region home, noting the grocery chain’s national reputation for quality and innovation. Wegmans is involved in a number of Cornell initiatives, including the Center of Excellence. Wegmans was represented at the conference by Bill Strassburg, who, as part of his job, has been a key player in a number of Cornell initiatives, including the Center for Excellence. Nyrop pointed to the success story of Geneva’s Cheribundi, whose tart-cherry juice products were developed in conjunction with Cornell. The company grew so much that it left its home at the Cornell Tech Park for its own facility in the town of Geneva. It now employs over 50. He said Cheribundi is an example of what can be achieved at Cornell AgriTech.